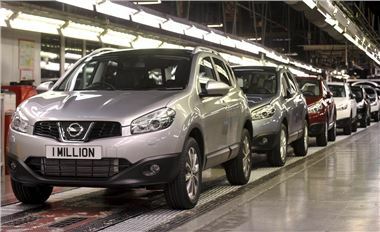 The one millionth Nissan Qashqai to be produced at the Sunderland plant rolled off the line today, and no other British built car has ever reached the million mark in such a short space of time. The silver 2.0-litre diesel TEKNA model was driven off the line four years, six months and 23 days after production initially started in December 2006. The Qashqai has been a success for Nissan and its popularity has helped towards the decision by Nissan to design, engineer and produce the next generation of the crossover in the UK, safeguarding 6,000 jobs. The millionth Qashaqai will be displayed in the O2 arena in London, where it will become the prize of a competition. The Sunderland plant has produced two other models that passed the one million mark – the Micra, of which 2.3 million were made from 1992-2010, and the Primera, 1.4 million of which were made at the plant between 1990 and 2007. Details of the competition to win the Qashqai will be announced soon.